Developed by the March of Dimes Perinatal Data Center, PeriStats delivers the most current U.S. maternal and infant health-related data available from multiple sources. Graphs, maps, and tables are user-generated and downloadable for fact-finding, health assessments, grant writing, policy development, lectures, or presentations. Take all U.S. maternal and infant health data available from 12 government agencies and organizations (including the March of Dimes, CDC, U.S. Census Bureau, and USDA) and make it available to users not necessarily familiar with data visualization. It must also be customizable by geography, date, and more than 21 topics, including preterm birth, infant mortality, tobacco use, cesarean section rates, and health insurance coverage. Additional layers of customization—race, ethnicity, and maternal age—were also required, totaling more than 60,000 statistical combinations available for (free) output as graphs, maps, and tables. Regardless of the massive amounts of intricate and complex data behind the scenes, the user interface must be clean and intuitive, and the user experience smooth and frustration-free. This means it must first be familiar; the audience is best served by integrating controls they’re already comfortable with. Additionally, to be beneficial to the user, the output must be concise, consistent, and attractive. We also wanted to deliver the information in multiple formats for instant access and to inspire sharing, discussion, and action. 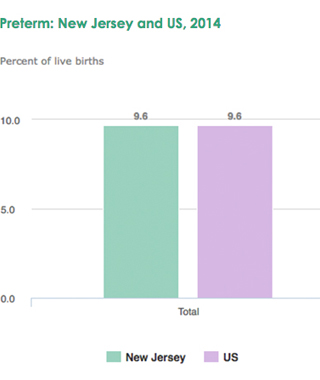 We took PeriStats’ 15-plus years of raw data, collected from eight major sources, and created more than 60,000 different ways to understand maternal and infant health. For the numbers to truly speak for all the mothers and children behind these numbers, the output—maps, graphs, tables—must be accurate, consistent, and honest. We first dug deep into the data and the story it was trying to tell. Once visualized, patterns emerged and inspired useful, relevant interpretations. For PeriStats and their audience, this translates into a clean, intuitive interface (i.e., dashboard) that delivers and makes sense of life-changing information for health professionals, researchers, medical librarians, policymakers, students, the media, and of course—families. PRI has a long history of working with clients to build products and websites that engage their customers through data visualization. In fact, we consider this a specialty of ours: Making sense of and clearly communicating complicated concepts and data, all while standing out from the mass of competing data streams.